“Risk more than others think is safe. Once in a while I like to watch old “Twilight Zone” movies on Netflix. They are in black and white with limited effects but they are a bit fun in a bizarre sort of way. I can’t watch more than one though as they always have a negative ending and that I can only take in small doses. I am reading a mystery story and although I have to finish it – I already know one of the main people is going to end up dead. I do not like that sort of thing. I like nice tidy endings, with golden promises for a “lived happily ever after” finish. Whether that is realistic or not it’s what I like. I told myself I was taking a complete day off from working on the puzzle book – but – I heard from Riley that he will design my logo for my business. And that is a happy ending for the day. I love black and white movies and old TV shows. Grew up watching Twilight Zone, great show. 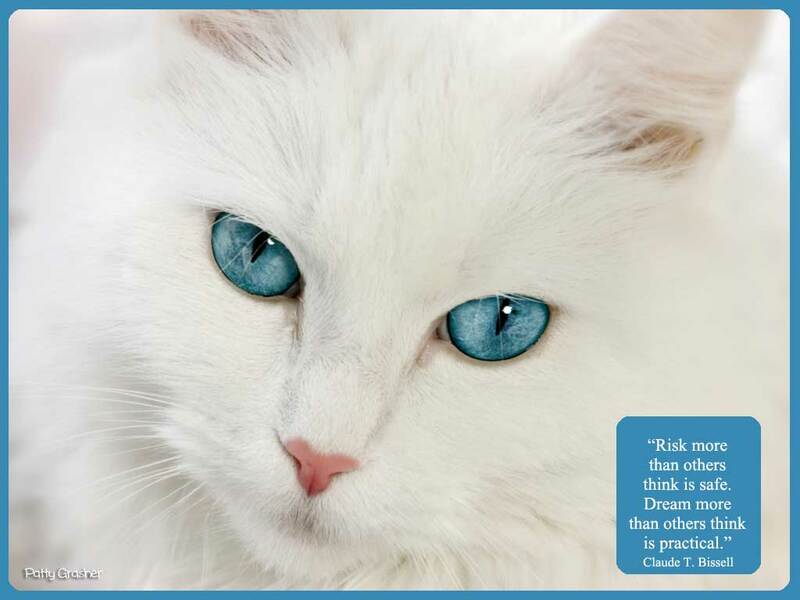 The white cat in the above picture is so gorgeous, my youngest son and his wife had a white cat (Casper) his eyes were green, he was a beauty. Happy to hear Riley will design your logo. All is coming together. Bitter cold here 12 degrees, brrrr.